A gritty, brutal WWII shooter that uses its scale, setting, and fidelity to great effect. Vulnerability is an underused tool of FPS developers. Plenty of shooters empower us—by stamping experience points across the screen when we bag a kill, by handing us exaggerated guns or an array of increasingly fancy hats—but what pervades Rising Storm is the feeling that you aren't a soldier-superman. You're a set of fatigues wrapped around fragile humanity, ready to lose your dogtags. Two years after the release of Red Orchestra 2, this standalone expansion to it is a little grittier and much more focused and technically sound. Tank combat and a single-player mode are out, and essentially gone are the bugs and performance issues that plagued RO2's initial release. Safety remains a luxury, and death is often anonymous and instantaneous—artillery shells and cooked grenades will unexpectedly separate your legs from your body, flame clouds will fill your bunker without warning, and bolt-action rifles will reach you from across the map. The near-constant sense of danger is part of what distinguishes Rising Storm from other multiplayer FPSes. 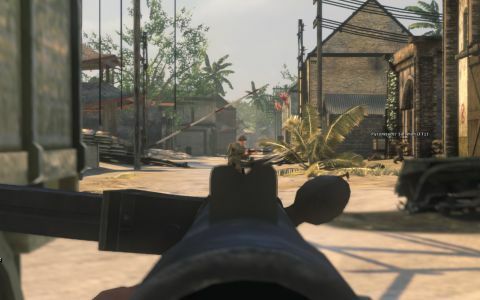 But Tripwire's feat is rendering this brutal, relatively authentic version of Pacific war and bending it into a balanced, mostly unfrustrating competitive shooter. For almost every emotional valley that results from random death, there's a corresponding high that arises from the gunplay. When you carve out a flanking route in a jungle map with great patience and wipe a whole reinforcement wave with a Thompson. When you connect on back-to-back shots with a bolt-action rifle. When you find the second-floor window that gives you the perfect shooting lane on the enemy advance. Almost every kill in Rising Storm feels earned through of some combination of good positioning, instincts, timing, spotting, patience, or reflexes. There are roles that support scrappier, less precise, or more conservative play—any SMG role, the flamethrower slot, or team leader, respectively—but for the most part Rising Storm is a love letter to virtual marksmanship. It isn't a coincidence that Tripwire displays the range between you and your victim for every kill you score, and the ballistics modeling underneath the hood is a smart compromise between being authentic and being intuitive. Bolt-action rifles, for example, can be dialed in to different ranges with the mouse wheel (ranging the Japanese Type 38 to 300m or more flips up a folding sight), but these guns are so straight-firing that it's almost unnecessary to do so. Against the odds of its 64-player scale, I love how important individual shots feel in Rising Storm. Defending from a rooftop on Peleliu, I caught a flamethrower soldier crouch-running around the side entrance of the factory I was perched on. Our angles were such that I only had time for one aimed shot, or maybe two snap shots if I hurried. I missed, then seconds later heard the death screams of my cooked teammates below. Now every time I eliminate a flamethrower (most maps allow only one or two), there's the palpable sense that I saved lives and slayed some sort of terrible WWII dragon. In practice, playing as the flamethrower feels like you're a glass cannon. You have to protect yourself as you maneuver into position before you can ambush a bunker or firing line of Japanese, and moving while being unable to return fire against long- and medium-range threats is a tense dance. It's a tiny miracle that Tripwire can balance such a destructive role without muting the power you feel as you're slinging heat—it's one of the best examples of the studio's mastery over vulnerability and empowerment. It's also an example of how embracing the asymmetry inherent to Pacific infantry combat gives Rising Storm's two factions personalities that wouldn't be present if Tripwire had simply mirrored the armories and abilities of the American and Japanese. In place of the Americans' flamethrower or their semi-automatic M1 Carbine and M1 Garand, the Japanese get a portable mortar role and the ability to bury basic grenades as land mines in any soft ground. Every Japanese soldier can join a Banzai charge, a running melee attack that suppresses nearby enemies, temporarily boosts your damage mitigation, and grows in radius and effect as more Japanese join it. It's a key mechanic of Rising Storm as well as a fun one—you can't shoot as you're sprinting, so joining the chorus of screams takes bravery to pull off, but when your squad sprints into a trench and guts a half-dozen Americans that've been sitting on a capture point for the past five minutes, you feel pride in your team. The Americans are more powerful on paper because their semi-auto rifles mean individual players can put lead down range at a faster rate, whereas executing an effective Banzai charge, accurate mortar strikes, and to some extent smart booby trap placement all rely on coordination and teamwork. And that's the main caveat to my praise of Rising Storm—a match comes slightly unraveled, a tiny bit moreso for the Japanese, when your team doesn't have a vocal leader. Players have to be willing to die in order to take and defend capture points. It might take two corpses to make an entrenched machine gunner reload, so that a third attacker can rush in and kill him. Likewise, artillery strikes (available to both sides) are a critical part of attack and defense. If squad leaders aren't marking targets and if your team leader isn't alerting grunts that they shouldn't attack the left side of the capture point because it's about to explode, your team will suffer. It's smart of Tripwire to not track players' deaths on the scoreboard (RO2 did), which will hopefully nudge some players out of a K:D mindset and get them to focus on taking territory. But otherwise, winning in Rising Storm relies on teamwork. Tripwire's collaboration with the Rising Storm modding team has also produced incredible maps. They're balanced nicely despite all being attack and defend, and they're visually and tactically distinct. Guadalcanal is a purple-skied night raid. Hanto is a swampy, overgrown jungle. Iwo Jima is a siege set against a grey, bruised beach. Saipan is my favorite, an urban jungle that culminates in the Japanese defense of a railyard and cavernous sugar mill—attacking it is like sieging a tropical castle. These island battlezones naturally feature fewer concrete structures than Red Orchestra 2's maps, which I like—it gives them a flatness and flow that urges you to keep moving forward rather than shack up in a secure, four-walled apartment. I also love the way that plentiful soft cover on maps like Hanto and Guadalcanal put your spotting and listening skills to the test. Rising Storm is liberated from the technical woes we saw during RO2's launch, but the single issue I have experienced, corroborated by other players on the official forums, are intermittent lag spikes on servers that are at or near capacity. Maybe one or two times per game, in about half the games I've played, everyone's ping on the server seems to peak and players start rubberbanding around the map. It hasn't happened frequently enough to really frustrate me, but it remains an occasional annoyance. On the design side, melee combat is a little rigid—I don't like that activating a bayonet attack during a Banzai charge stops you in your tracks instead of carrying your momentum forward, and hitboxes have occasionally felt narrow or inconsistent to me. The first-person cover system, though a little less cumbersome than it was in RO2, occasionally doesn't cooperate with your intentions. And visually, while Rising Storm's setting provides natural beauty and an excuse for sunshine on some maps, character models aren't as detailed as I wish they were, especially in terms of uniform textures, facial expressions and animation. Otherwise, you're looking at the best multiplayer shooter set in the Pacific, and the best WWII FPS since Battlefield 1942. Rising Storm's period-accurate weapons emphasize precision in a way that isn't present in other shooters, and the way danger, teamwork, and a sense of authenticity permeate the experience make it an essential game for multiplayer FPS players.